This is well known as the William Wallace Sword; a Scottish sword. One of Scotland’s outstanding national heroes, Wallace had a price placed on his head by King Edward I, known as Longshanks, for treason. Refusing to accept the treaty by which Scotland submitted to English rule, Wallace captured several fortresses and inflicted a severe defeat on the English forces in September of 1297, after which he was proclaimed Regent. In 1298 King Longshanks invaded Scotland and defeated Wallace’s army, forcing him to flee to France. When Wallace later returned to his native Scotland, he was captured, tried for treason and executed. Before his death he proclaimed, “They can take away our lives, but they will never rob us of our FREEDOM!”. 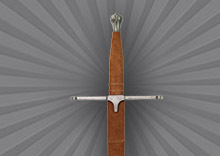 The sword includes free engraving of 20 characters along its blade and a wall mounting fist. The blade is 52 inches in length and has a leather clad handle.